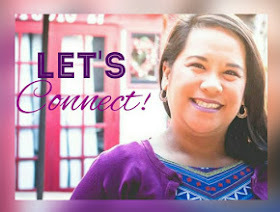 Bloggers Unite: A Fundraising Giveaway Event | Over $860 Worth of Prizes! As if a 7.2 magnitude earthquake last October wasn’t enough, the central region of the Philippines was hit by another disaster, a 295 kph typhoon on November 8, 2013. Supertyphoon Yolanda (International name: Haiyan), one of the most powerful storms ever recorded, smashed the central part of the Philippines and left hundreds of millions of destroyed of properties, death toll at around 4000, and over 650,000 displaced survivors desperate for food and shelter among others. 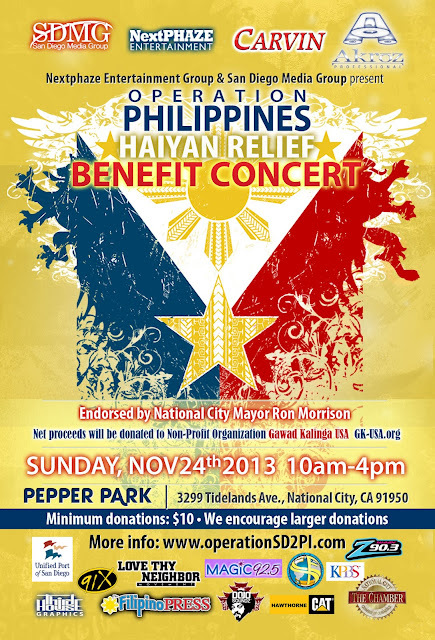 on Sunday, November 24th at Pepper Park from 10am-4pm. Live performances will be announced later this week. Join us to help with this great cause to help the families that have been affected. If you have any questions, please contact us atwww.operationSD2PI.com. Check out the Facebook Event page also! 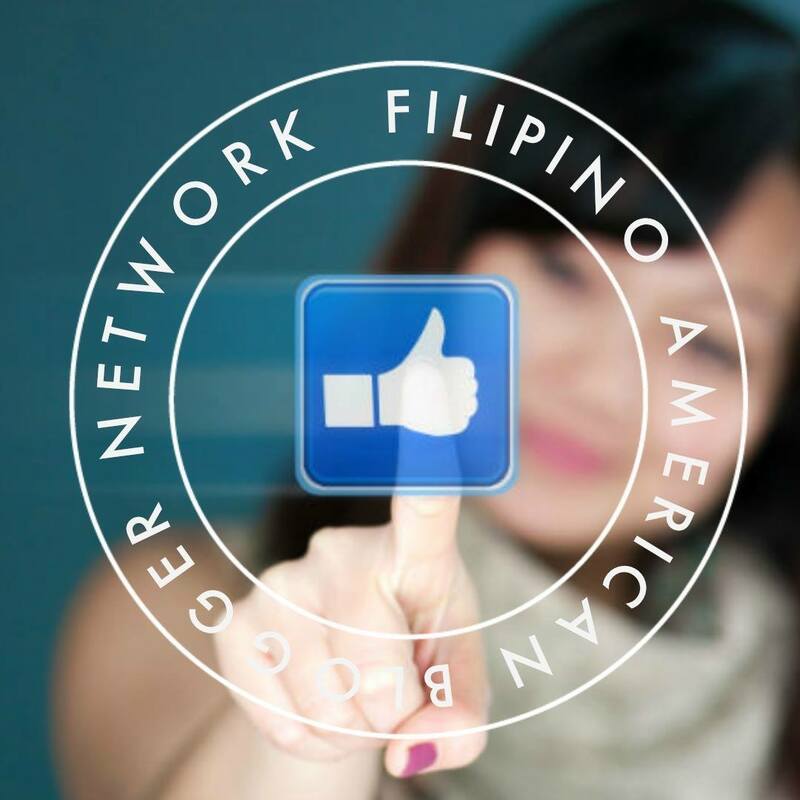 Net proceeds to benefit Gawad Kalinga of which several of my colleagues and family volunteer! Please share, tag, and post this flier to share with your family, friends, communities, schools, churches, clubs, workplace and organizations. “I am participating in a campaign on behalf of Mom Central Consulting for the California Mental Health Services Authority. 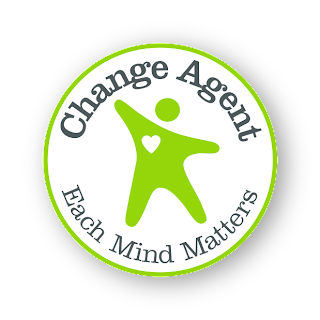 I received a promotional item as a thank you for participating.” I'm honored to announce my participation in Each Mind Matters Ambassador Program as to highlight awareness for Mental Illness and Mental Health Challenges surrounding the holiday season. The school district with which I work experienced a loss of a student recently. The student, a victim of school bullying, had experienced challenges in dealing with academic, social, and familial pressures. He succumbed to suicide on a bridge right in front of his high school, with many of his peers watching. Most people don't know that nearly one-third of California’s 9th and 11th grade public school students reported extended feelings of sadness/hopelessness in the last year. I had so much fun this year for Halloween! At work, it was Homecoming Week at the high school so it was spirit week each day. 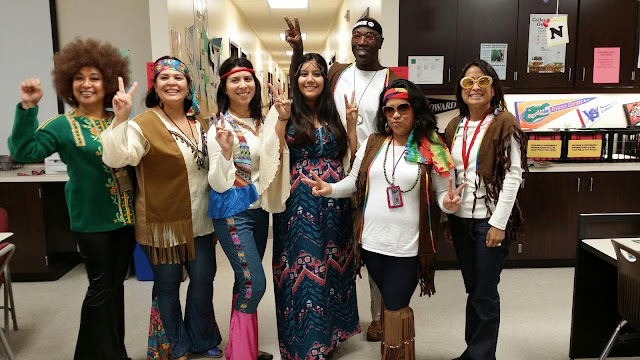 On Halloween Eve, it was "Way Back Wednesday" so my entire counseling team decided to be hippies! On actual Halloween, my entire counseling team borrowed the our school's mariachi groups uniforms! Here we are "El Mariachi de Consejeros"! Here are my boys, Superman and Mickey Mouse, along with their grandpa, the Nave Seal! We had a great Halloween! We hope you did too! Christmas is right around the corner! I'm always looking for different and unique gifts for the kids in our family. Thanks to Idea Village, my boys and I were able to try out some products that are great ideas for Christmas gifts! The first product we'd love to share are the Flipeez which are the fun, fanciful, animal action-hats that let kids of all ages “ﬂip their lid”! From the makers of Stompeez, the 2012 slipper sensation that sold 4 million units in 6 months, Flipeez are destined to become this season’s next BIG thing! Our boys had so much fun with their Flipeez! They were it everywhere we go and we get lots of looks and compliments on the "cool hat"! Here is a video of my Jelo having fun with his puppy Flipeez! own distinct “action”. Arms open or tails wag with a simple squeeze of the puff-ball in the tassel.